Current levels of carbon dioxide (CO²) in the atmosphere could lead to conditions comparable with the Pliocene period three million years ago, experts say. The last time levels of the atmosphere were as high as today – at around 400 parts per million (ppm) – was during this geological epoch. As I noted, it was more likely that the warmer climate led to higher levels of CO2, and not the other way about. But what caused the climate to cool down again in the late Pliocene? Many theories have been advanced, but inevitably one bunch of wallies have blamed it on a decrease in atmospheric carbon dioxide! It is thought that the Northern Hemisphere experienced only ephemeral glaciations from the Late Eocene to the Early Pliocene epochs (about 38 to 4 million years ago), and that the onset of extensive glaciations did not occur until about 3 million years ago. Several hypotheses have been proposed to explain this increase in Northern Hemisphere glaciation during the Late Pliocene. Here we use a fully coupled atmosphere-ocean general circulation model and an ice-sheet model to assess the impact of the proposed driving mechanisms for glaciation and the influence of orbital variations on the development of the Greenland ice sheet in particular. We find that Greenland glaciation is mainly controlled by a decrease in atmospheric carbon dioxide during the Late Pliocene. By contrast, our model results suggest that climatic shifts associated with the tectonically driven closure of the Panama seaway, with the termination of a permanent El Niño state or with tectonic uplift are not large enough to contribute significantly to the growth of the Greenland ice sheet; moreover, we find that none of these processes acted as a priming mechanism for glacial inception triggered by variations in the Earth’s orbit. They do not offer an explanation of how or why CO2 levels fell. Nor can they explain why the bout of global warming in the mid-Pliocene did not lead to runaway warming, via higher levels of CO2, melting ice caps etc. But I expect they received nice fat grants for their junk science. Tricky stuff that ol’ CO2. And to think they put in Coke. My washing machine broke last week. Probably CO2. CO2 levels were 4400ppm in the Ordovician Ice age and 2800 ppm in the Jurassic/ Silasiun; confirmed in ice core samples. This causes great distress to alarmists and I use it all the time in my arguments with them. I find myself sticking to the facts whilst they shift the goalposts and squirm whilst they try- and fail- to explain why just 400ppm causes warming today when 4400ppm didn’t during ice ages! One common response from this group is that the energy output from the sun was weaker then than what we experience today. According to them CO2 trumps everything including the sun, seems they want it both ways . . . I totally agree. The alarmists say it’s not the Sun’s influence, it’s all CO2. Then once presented with the ice core sample data they panic, then usually, look on the childishly named skeptical science website- which is actually an alarmist site – this site declares the Sun’s output was low and that CO2 levels were ten times pre- industrial levels – thinking nobody will check what pre- industrial levels were – 280ppm x 10 is of course 2800ppm. Which is still around six times higher than today. I once had a two day argument with an alarmist through the Daily Mail comments section and the guy shifted the goalposts so many times that he tied himself in knots. Even when their pathetic beliefs are exposed they just carry on blindly without even acknowledging their theory is completely wrong. It’s no wonder skeptics label climate change as a new Religion. When I read things like that paper, I wonder what happened to the research that demonstrated that paleo CO2 always followed temperature changes rather than preceded it. Well that calculation would require a full knowledge of all those pathways in the carbon cycle which are traversed every few decades. Also, once the “excess” CO2 was removed from the air, much of that would be immediately replaced by outgassing of CO2 from the ocean. The whole system would have to be rebalanced. Very, very, few people realize that >99% of CO2 absorbed “into” water simply stays there as ordinary gas mixed with the fluid (which is why “acidification” is a risible over-simplification). My guess at an answer is, “fifty years” – if human emissions stabilized immediately. Quite intriguing is the recent discovery that meso-benthic fish are ten times as abundant as formerly estimated and transport carbon DOWN from the surface much more effectively than formerly thought. Because, each day they eat at the surface and retreat to poop in the deep. You know that climate promo with polar bears falling from the sky – the walruses are doing it for real. All the fault of climate change of course – although the comments section isn’t buying it! I should imagine population growth and being spooked by film-makers and scientists is closer the mark than ‘shrinking sea ice’. My mistake. Stalked by extinct polar bears, probably. So CO2 could give us a climate like the Holocene Climatic Optimum? I wonder why they call it a climatic optimum? The formation of the Isthmus of Panama in the Pliocene had major consequences on global temperatures, since warm equatorial ocean currents were cut off and an Atlantic cooling cycle began (changing the Thermohaline circulation ), with cold Arctic and Antarctic waters dropping temperatures in the now thermally isolated Atlantic Ocean; at around the same time Africa’s collision with Europe formed the Mediterranean Sea & cut off the remnants of the Tethys Ocean & the opening of the Drake Passage changed the Southern Ocean circulation. As the world cooled (Milancovich cycle) & the tropical water was cut off (Panama) the cooling Atlantic waters allowed the Arctic icecap to form & Antarctica to move from tundra to permanent ice. The cold water absorbed more CO2 eventually dropping atmospheric CO2 to ~ 180ppm leading to drastic plant (& animal) species loss. Thank you. I was just beginning to gather the information to say what you said. Glad I read your piece prior to writing mine. It is interesting that these geniuses ignore the climate changes which occur with continental drift. They miss little things such as the Rocky Mountain Orogeny leading to the formation of the Great Plains to the east. The moisture was now captured by the mountains and thus the plains area became a drier savannah/prairie formation. In West Virginia, the Allegheny Section of the Appalachian Mountains is the same situation. Once they were higher than the Rockies, but have eroded down. I live west of the Allegheny Front which is the Eastern Divide. Just to the east in the Ridge and Valley Province, the rainfall is half what it is to the west. Due to basic rock formations and thus soils combined with reduced rainfall, the area has an abundance of endemic plant species found nowhere else. One of the most interesting courses I had when working towards my MA in plant taxonomy/ecology was Geobotany. This was the late ’60’s when the world was once more beginning to “discover” Alfred Wegener’s 1912 Continental Drift Theory. It had been poo-pooed by the usual suspects of the “learned group.” However, botanists and zoologists had long been smitten with the theory as it was the only sensible explanation for the distribution of plants and animals. Geologists could not help but notice the similarities in the geology between eastern North America and Africa. Wow and wow again, why do they try to deny it, this constant attempt to rewrite the natural laws, a rhetorical question of course, we damn well know why. CO2 is a product lagging SOLAR warming, as is cooling and that comes first, then it follows a collapse of CO2 – who knew? How dare they argue to the contrary – it’s just a denial of logic and the natural way of the Universe thrown under a bus. All the £$€ billions wasted in the discombobulation of wasted effort of attempting to effect the release of what is a very beneficial, valuable outgasing of CO2, the human hubris, moved up to insanity, we only add in 5% at best anyhow…………….the natural world does the rest, funny that the warmunists always decline to mention that salient truth at all – I wonder why not? When, the real and terrifying prospect of a clouding over of the planet which somehow for whatever the reason, climatic factor? Be it volcanic or extra terrestrial – no not little green men (although, we’ve plenty of them about now) but meteorite rock/comet effects and of course our own sun occasionally going into relative stasis. Indeed it is abrupt, ‘the big sleep’ can happen in a time frame reckoned to be as little as 5-10 years. As CO2 levels collapse (250 ppm) and the ice returns big style, warming becomes a distant memory in a matter of maybe just 60 Months. It has been pointed out, during the LIA Scotland’s north and east facing Corries on the highest slopes were beginning to accrete neve, early formation of glaciers was a recorded occurrence. Finally it begs, should ‘we’ mankind not be seeking to understand that awful prospect – the trigger and sequences of and to cooling and not be overly concerned with natural warming? The linked researchgate report is dated 2008. Back in the days when fully coupled atmosphere-ocean general circulation models could be trusted. No mention of the Holocene Climatic Optimum when temperatures were a couple of degrees warmer and sea levels over 2m higher. Oh, yes, CO2 levels supposedly were about 250 ppm or less. And of course solar radiation remains absolutely constant, doesn’t it? Well, apart from the 11 (or 22?) year sunspot cycle, which itself never varies…well, apart from the Maunder Minimum (and Dalton Minimum). So the Sun has no effect on the climate: it’s an Ultra Constant Emission Zone or UCEZ to its friends. I tell you that cos the BBC only let that slip out on the Sunday 6pm radio news. The web reports don’t mention that. I wonder how long it would take in a proper vehicle. ‘John’ from Grand Tour for example. Perhaps Mr Wilman could set the boys on it for the next series. And still TREES … The very things that absorb CO2 ans release oxygen are chopped down wholesale to plant palm oil trees. Then just to make sure of messing up the planet, they chop and pellet more trees to burn in the likes of DRAX power station releasing all that stored CO2 again and all because of money! The alarmed climate community has chosen to ignore or dismiss the geological and geochemical data from the late Eocene, about 34 Myr-ago…. 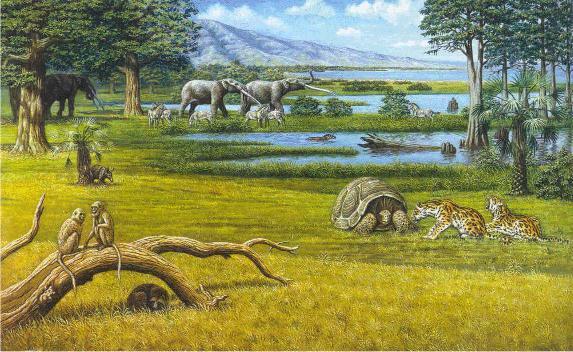 The Eocene CO2 was more than double what it is now. The climate was mild. The plant life on land was lush. The pH of the oceans was lower than now but the carbonate-secreting plankton thrived…no “dangerous acidification”. Uhhh maybe the trees & animal remains slowly became oil and gas underground? Moved carbon from air into ground. Hence caused cooling? The process which took millenia we’re stoking in a few hundred years. The process we are attempting to stoke is political scaremongering our future climate, but with no chance of stopping it by removing CO2 from the air and re-burying it. Nature did it slowly. Humans cannot do it at all, regardless of the number of years.